The Tenba Photo Insert for Pro Digital 2 Bags comes with the messenger bags, and can be used separately in other suitable bags. 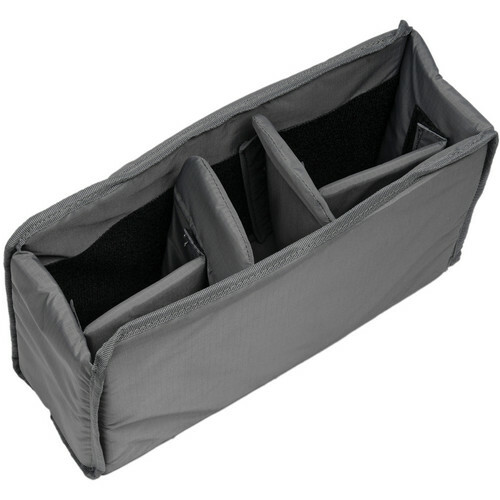 The bag has three sections for lenses or other accessories. Replacement insert for Pro Digital 2.0 Messenger bags. It can be used separately in other suitable bags. Three sections used for lenses or other items. Box Dimensions (LxWxH) 14.0 x 10.0 x 6.0"
Pro Digital 2 Photo Insert is rated 4.8 out of 5 by 183. Rated 5 out of 5 by Kendo from Excellent insert for Timbuk2 bags I have a few Timbuk2 bags and was looking around for a photo insert. I first looked at what Timbuk2 offered but found out they were just too expensive. I did more research and people were recommending the Tenba photo insert. I have a Timbuk2 Small and Medium sized bags and the insert works great for both. For the small sized bag, the insert fits just right with no room for anything else except the insert. With the medium, you will have a bit more room on the sides but overall it will be a looser fit than with the small. I mention this because a lot of people were wondering whether the Tenba would be a good fit for the Small sized bags. Overall, I'm very happy with this considering the cost. Highly recommend it! Rated 4 out of 5 by Anonymous from Useful and affordable Bought this insert on a whim to help make more bags camera-able with a bit of padding. I've used the insert in a Bailey Works 253 Medium messenger bag, Timbuk2 Medium messenger, and a generic backpack successfully. Some folks use it in the crumpler 7MDH, but I preferred the stock dividers. Bit too tall for my Domke F2. It's simple, nothing hidden here, but it's handy to make a bag that looks like it might not be full of valuable gear. Every camera bag claims that their bags don't look like camera bags, but really you're better off with a junky generic backpack and this than a fancy crumpler or similar, if that's really a concern of yours. Rated 5 out of 5 by Anonymous from Perfect for my Timbuk2 messenger bag I love my Timbuk2 messenger bag. It is a SM/MED size that fits my 13 MacBook neatly. I've scoured the internet for a camera bag that wears like a messenger bag (not like a backpack) and looks a little more stealth without looking like a camera bag that screams STEAL ME!. I wish I found this sooner. This product fits PERFECTLY inside my messenger bag and it has neatly converted it into the perfect camera bag. The nicely padded sections are customizable to secure and protect your gear. I am able to fit my DSLR w/ a mid-zoom, a speedlight and another zoom lens. I feel very secure knowing my gear is stowed away and protected. Highly recommended. Rated 5 out of 5 by cjt from A great solution This product is as described. I wanted a messenger bag style camera bag (I was looking at the Timbuk2 Snoop) but I already have a Patagonia Half-Mass messenger bag that I love. The Tenba insert fits inside well, with a little extra space on each end. I can even leave my bag's laptop sleeve inplace for when I travel. The dividers are moveable so you can store different types of gear in any orientation. I use it to transport a Canon 7d with 24-70 lens attached, a 10-22 lens, both lens hoods and Canon G10 point and shoot. There is still plenty of room for a flash or additional lens. Good solution if you already own a messenger bag that you like. Rated 5 out of 5 by Anonymous from Great insert for any messenger bag I bought this insert to put in a cheap canvas messenger bag. Works like a charm. The photo of this insert here is a little misleading. The one I received is neutral gray - not white. Also, there are 4 dividers in total. The center two dividers have ears to hold an SLR in a vertical position with a lens attached. It fits my Rebel Xti with 75-300 lens attached perfectly. There's also room for a Canon 17-85 IS lens, a 100mm macro, a portable hard drive and miscellaneous cords and gadgets. The internal dimensions are about 13 long x 4 wide x 9 tall. The dividers allow you to create various compartment sizes. On various photo websites you'll find whole discussion groups where folks have used this insert to convert popular messenger bags to photo bags. It's a great way to create a discreet, non-camera bag looking bag. You can also just lift the divider out, camera and all, when you want to use the messenger bag for another purpose. If you have the idea to convert a messenger bag to a camera bag this just might be the ticket for you. Rated 5 out of 5 by Anonymous from Very versatile I use this photo insert in my messenger bag. It's light, well-padded, and quite durable so far. It's the perfect thing to carry your equipment in when you don't feel like bringing your main bag. I worried about lugging my camera around everywhere I go. Now I can safely carry my camera, laptop, and books all in my messenger bag without having to bring my entire camera bag as well. It doesn't hold much, though. You can expect to carry a camera body and two to three lenses at maximum. Of course, taking too much gear is a hassle and you may end up thinking too much about lens selection when you could be out there taking shots. Rated 5 out of 5 by Jake from Great Domke Insert I had read from other reviews that this insert was a good fit for the Domke F-802. It does fit perfectly, and is very versatile. I currently have loaded. Nikon D300s with 24-70 mounted in the center space, 16-35 in one side and SB-800 on the other side. The Domke F-802 is deep enough to hold a 70-200 in one side of the insert in place of either a flash or other lens. With this gear loaded the package is not too heavy for walk around use. The insert is very well padded and provides sufficient protection for expensive photo equipment without being too bulky. Hi, I have the same question as Erik's What does it mean that the depth is 5.0/8.0? , however I'm not finding the answer very clear. Is this insert somehow expandable to different sizes? What is the external measurement of the shortest dimension across the top opening of this insert, exactly as it's shown in the product photo---5 inches? Or 8 inches? Thanks! The insert isn't expandable, the variation in depth refers to if you were to use the small dividers to divide the larger sections (e.g. lens stacking). The shortest external dimension is 8 inches. The variable depth of the Tenba Pro Digital 2 Photo Insert means that if you adjust the dividers, you can shorten the depth of the insert to five inches, or leave it open to have it remain eight inches deep. will this insert fit the Tenba BYOB10 bag ? what are the dimensions - interior or exterior - of this insert? can a pro DSLR body with two lens for this insert ? Yes, but it depends on the bag you insert it into. With the Timbuk2 medium with a a flap with the camera inserted in the middle part, lens pointed down, there is little extra space above, so I feel the camera can slip out since the messenger bag is not very rigid and due to no zip on the outer flap to keep the camera in, if the bag tips over. With a deeper bag then the medium Timbuk2, you may feel more safer.